The pilot North-East workshop – only the second of its kind nationwide – also showed the youngsters and their families how they can enjoy lucrative and legitimate careers out of their activities. Young hackers are learning how to use their knowledge legally. If successful, the scheme could become an official sanction alongside the same lines as a speed awareness course. The dozen delegates at the Newcastle workshop ranged in age from 12 to their early 20s. While many were from the region, some travelled from as far away as London for the event. They have all come to the attention of the authorities through activities such as attempted or successful attacks on websites, attempts to breech school networks and leaking sensitive information online. Some have received cease and desist orders forbidding them from repeating their actions, while others have been cautioned by police. Co-ordinated by not-for-profit organisation Cyber Challenge UK, the workshop at Newcastle University was supported by the National Crime Agency and the North East Regional Special Operations Unit (Nersou). The day included talks by representatives from the organisers and speakers from major technological companies such as BT. Paul Maddison, Nersou’s cyber prevention officer for the North East region, said that parents are often shocked to find out what their children have been up to as they do not understand what they are doing. Paul Maddison, from North East Regional Special Operations Unit (NERSOU). Separate sessions were also held for parents so that they can spot potential signs of online criminality. Schools may also become involved directly in future workshops. Pc Maddison added: “It’s critical to bring together the young people and their parents to try and get them on board. Thirteen-year-old Joe was referred to the intervention workshop after hacking into a bank account. 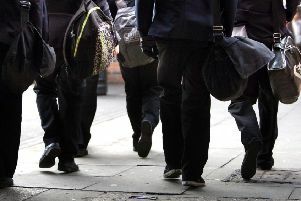 The trail led police to his school and further investigations revealed that his activities had indentified holes in the school’s own cyber security system. Speaking at the course, Joe, who is from the North East, said: “I like making and breaking stuff and messing around online. “I hacked a bank account and the police came to my school. Discussions led to Joe taking part in the pilot North East workshop in Newcastle. Bryony Chinnery, from Cyber Challenge UK, said: “We are helping young people learn all about cyber security and sticking to the right side of cyber law. “Some of the attendees have dabbled with hacking, some of them may have broken the law and been given cease and desist orders or cautions. “Some of them have been referred from school and this is all about them learning what’s rights and what’s wrong and how to make the right choices in the future so we are giving them lots of information about careers and routes into the industry. “This is the third pilot. We had one national pilot and then we’ve been spinning out regional pilots. “It’s testing the way these workshops will go, but the hope is that in the future there will be a national disposal for the National Crime Agency and regional organised crime units and also maybe something that the Ministry of Justice can use as a court disposal potentially. “We’ve got 12 young people here today, most of them are local to this area, but a few of them have travelled from other parts of the country as well, I think the furthest have come from London. “They are all on referral schemes and have been carefully selected people who can still have this intervention and haven’t gone too far down the cyber-crime route. “The youngest is about 12 to 13 up to early 20s. That’s the kind of age of age group this type of activity starts to happen in. “They get into that really curious mindset and they start exploring online, seeing what they can do, what their skills are.